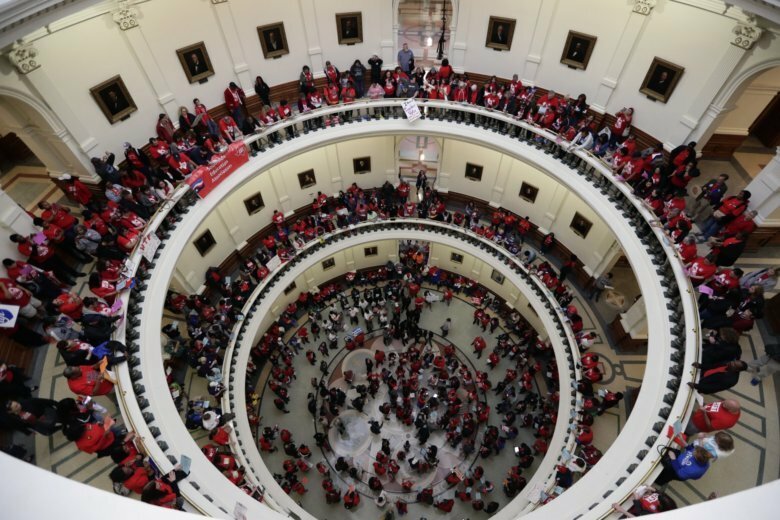 AUSTIN, Texas (AP) — Schoolteacher raises of $5,000 are on the table in Texas — a proposed pay hike that ranks among the biggest in the U.S. since a wave of teacher unrest began last year. But protests aren’t why the money is suddenly available. Texas hasn’t even had a teacher strike. But as in other GOP strongholds this spring, lawmakers who have spent years clashing with public schools by slashing budgets, ratcheting up testing and cheerleading private schools are blinking in the face of election pressure as much as picket lines. Rattled by a dreadful midterm election for Republicans — and looking ahead to 2020 — conservative-leaning states including Georgia, Oklahoma and South Carolina are pouring new money into schools. And to ensure it doesn’t go unnoticed, Republicans are making a show of a renewed commitment to public classrooms, courting voters turned off by years of cost-cutting that catered to the party’s base. To some, the message was clear. Said Republican state Sen. Kel Seliger, quoting a top GOP official “way up” whom he wouldn’t name: “Urban Texas is now blue. Suburban Texas is purple and it’s rural Texas that is still red. And then what does that mean for the future” of the party? A nationwide teacher revolt that began with walkouts in West Virginia in early 2018 is still kicking. In Kentucky, recurring “sickouts” for teacher protests forced schools to cancel classes, and a six-day teacher strike in Los Angeles ended with a 6 percent pay hike and commitment to smaller classes. In Oklahoma, the state’s new CEO-turned-governor , Kevin Stitt, made giving teachers another pay boost a key plank of his campaign. He’s pushing ahead with an additional $1,200 pay increase for classroom teachers, a year after several Republican opponents of a pay package were ousted in GOP primaries. In South Carolina, a state budget passed by House lawmakers would give all teachers a 4 percent raise and bump the minimum salary for first-year teachers to $35,000. Teachers there have asked for a 10 percent raise. Texas is in the middle of the pack nationally in classroom funding for the state’s 5.5 million public school students, and teacher pay is about $7,000 below the national average. In recent years, conservatives have pushed for directing some funding to students attending private and religious schools. That talk has now gone silent. Republican Lt. Gov. Dan Patrick, who pushed the “bathroom bill” in 2017, is now calling for $5,000 teacher raises, while House Republicans have called for an extra $9 billion for public schools. For both parties, “you do have a political constituency that supports public schools that reaches deep into the business community, deep into school boards and parent groups,” Leachman said. “I think people are fired up because of the results in November,” Smith said. Associated Press Writer Sean Murphy in Oklahoma City, Okla., and Jeffrey Collins in Columbia, S.C., contributed to this report.